Monthly report updates from our Reefscapers coral biologists at Kuda Huraa and Landaa Giraavaru. You may also be interested in our extensive report on Coral Bleaching (2016), our previous yearbooks for 2017 – and – 2018, and the Coral Frame Collection gallery to view photographs of your own sponsored coral frame as part of our Reefscapers coral propagation project. 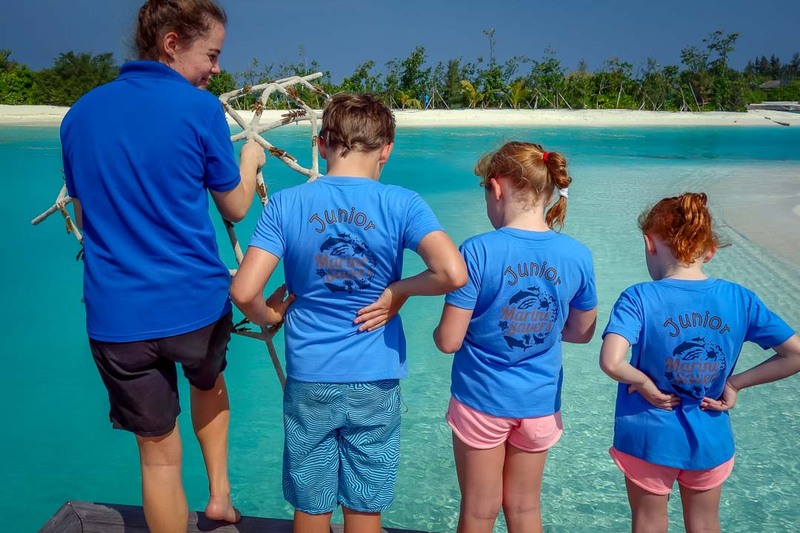 Below: Junior Marine Savers help with our Reefscapers activities. At Landaa Giraavaru, 21 new coral frames were transplanted during January (located mainly at the Dive and Al Barakat sites) and a further 350 frames were monitored (cleaned, maintained, photographed) around the island. In addition, we also relocated 250 frames under the central walkway at Water Villas, arranged into two parallel lines to provide shade from the sun during the upcoming warmer months, and to afford protection from some planned maintenance work. Due to the recent success of our exploratory dives, we have started a new area at ‘Anchor Point’, 18m deep. It is hoped that frames placed here will exhibit increased resistance to the impending warmer temperatures, due to depth and regular strong water flow. At Kuda Huraa, we transplanted a total of 18 new coral frames and monitored a further 195 existing frames around the island. Our repeat guests have been commenting on the improvements in appearance of the corals in the Channel snorkelling area. 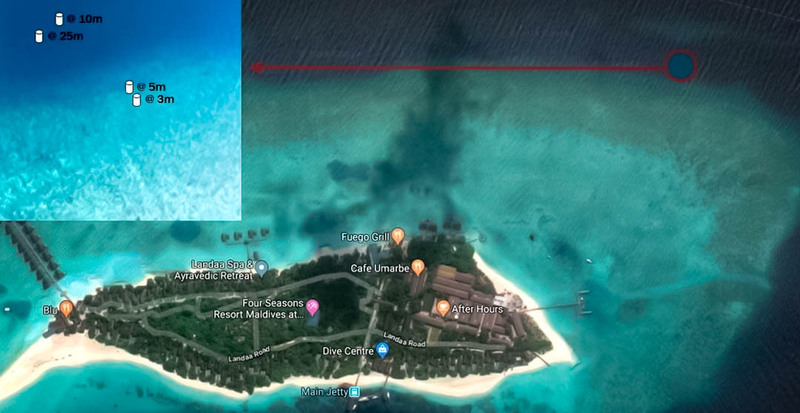 In the coming months, we will focus frame deployment at the Water Villa site, which offers shading under the boardwalk to minimise the potential for coral bleaching (currently predicted by NOAA for the end of May). The house reef continues to be a difficult site, as our recently transplanted Montipora fragments have been predated by fish. Acropora fragments harvested from large House Reef colonies show greater resilience to predation, but these are in limited supply. 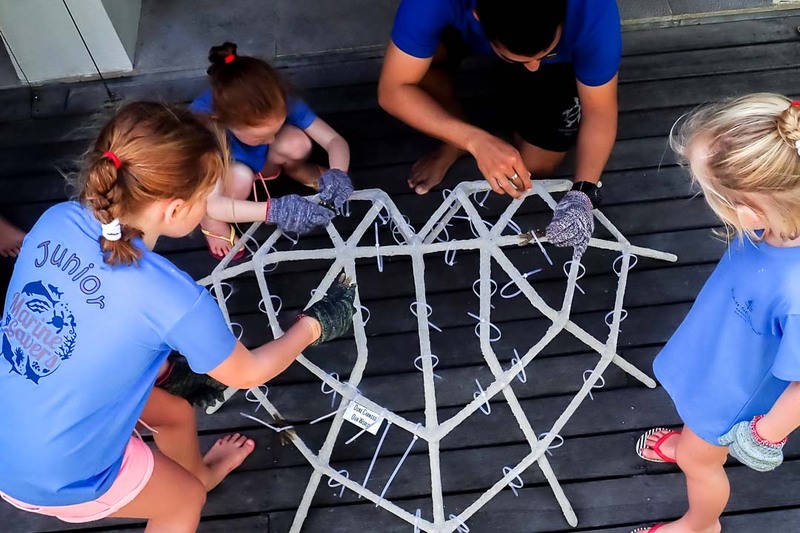 Some Crown of Thorns (COTs) were removed from the Water Villa frames; our records do show increases in COTs during this monsoonal season (December-February). 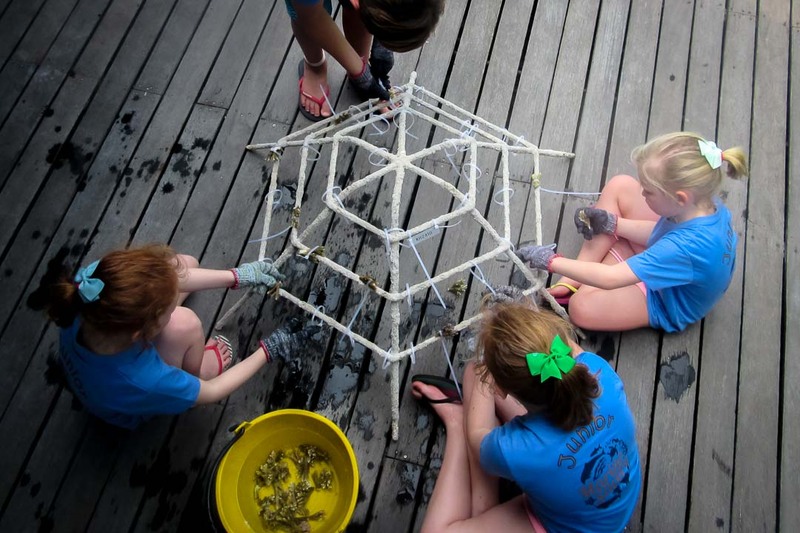 We have been making a new starfish pattern on the western reef flat. Frames were relocated from the shallow House Reef as the coral here continued to experience heavy predation and excessive growth of macro algae. 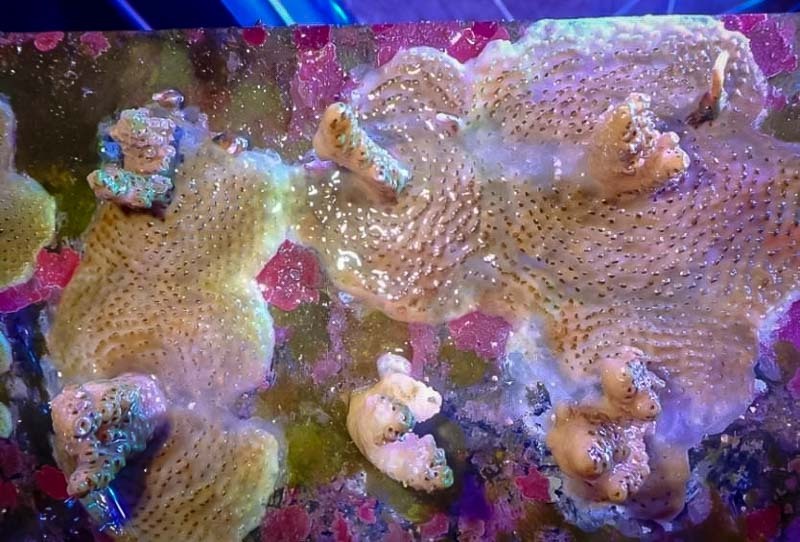 Many of the frames are currently in poor condition and require extensive replenishing with site-specific resilient species (Acropora digitifera, staghorn Acropora, Pocillopora). The Acropora millepora coral fragments have now fused together, and the distinct boundaries are no longer visible. In addition, an encrusted Acropora tenuis seems to be overgrowing and killing the neighbouring A.millepora fragment. At Landaa Giraavaru, 50 new coral frames were transplanted during February, and a further 250 frames were monitored (cleaned, maintained, photographed) across many of our sites around the island. At Kuda Huraa, we transplanted 15 new coral frames (and refurbished a further 21 frames) and at Landaa Giraavaru we made 50 new frames and monitored (cleaned, repaired, photographed) a further 254 frames. In the Maldives, the warmest part of the year predictably arrives during the dry, sunny months of March and April. This results in peak ocean temperatures towards the end of April, when the corals are at their most vulnerable, and can result in noticeable coral bleaching during April and May. We are employing various methods to monitor and to minimise the extent of the coral bleaching on our propagated coral frames. 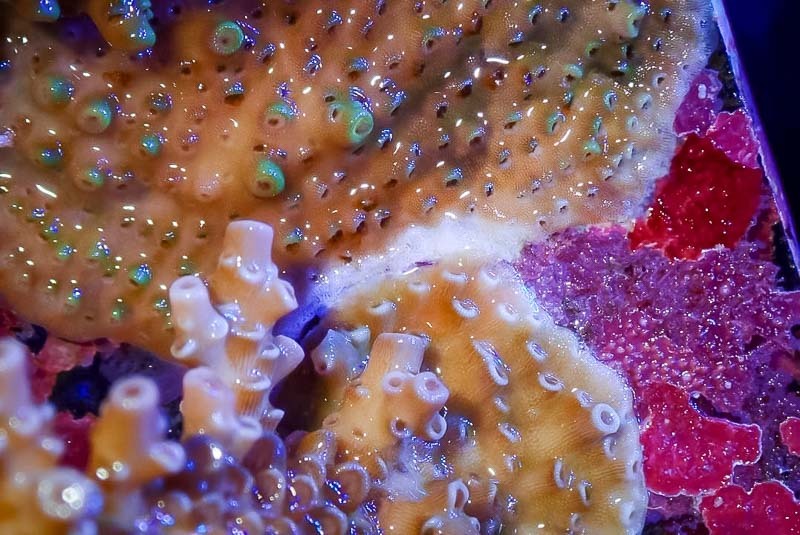 Placement of our frames is important, with shading and depth providing lower temperatures and decreased levels of UV rays that can cause extra stress (particularly to newly transplanted coral fragments). Our water villas provide ample shade below the boardwalks, and are a good space to experiment with a variety of positions and locations across the lagoon. 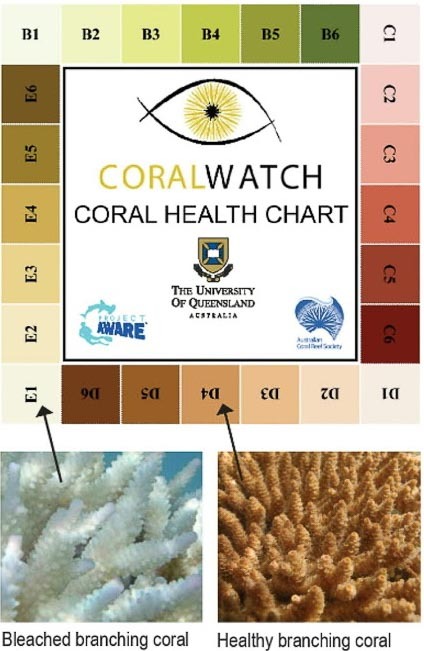 Using the CoralWatch chart (right), we will conduct a pre-bleaching analysis to establish a baseline for coral colouration. Periodic surveys will then be conducted to monitor closely for signs of coral paling and bleaching. This will be followed by analyses of the data across each site and on the natural reefs close by. Historically, we know the newest frames (transplanted within the last 6 months) are the most vulnerable to elevated ocean temperatures. 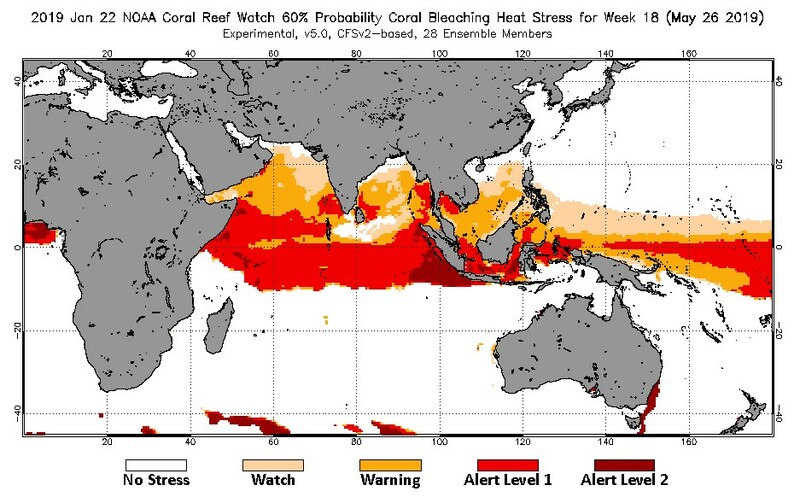 Based on NOAA predictions, it is so far unknown just how severe the bleaching will be, so transplantation of frames will continue until paling of the existing corals is observed. 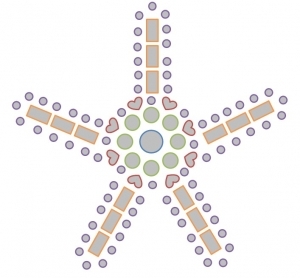 We will be locating most of our new frames at deeper sites (10m-18m), and using coral fragments harvested from healthy and diverse colonies in those areas. The more exposed areas with strong ocean currents will provide extra respite from any increase in water temperatures. Known resilient species (eg. Pocillopora) will be selected in order to continue transplantation efforts, and new frames will be immediately deployed to shaded areas. 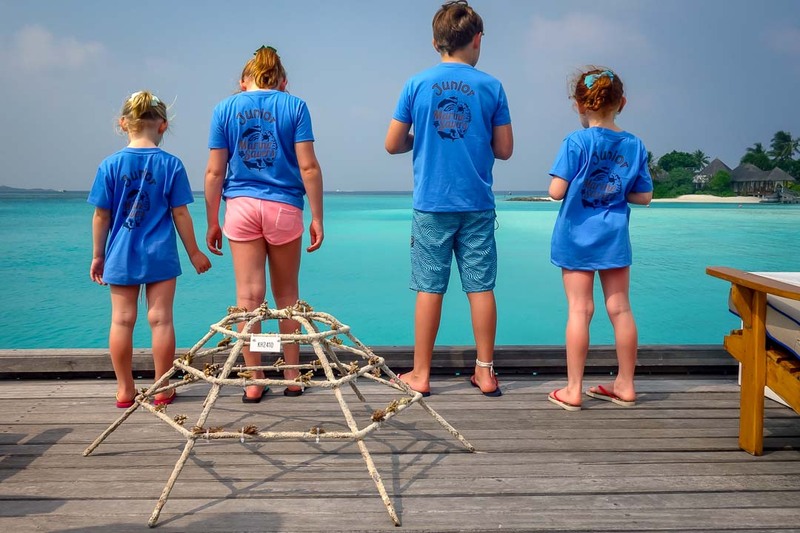 If coral paling/bleaching becomes widespread, we will stop transplanting new frames, and more of our ‘younger’ frames will be relocated to the shade of the water villas. Relocating all our shallow-water coral frames from the last 6 months would be a large task, however, we do plan to relocate the most vulnerable frames around the Water Villas. Some frames with healthy Acropora colonies will be moved to the house reef (at Kuda Huraa), to determine if established colonies can withstand the intense fish predation at the site. These frames will be closely monitored to see if other established frames can be safely relocated there. At 10m depth, these frames are less exposed to daily temperature fluctuations (as confirmed by our temperature loggers), and should be more protected from elevated temperatures. We also plan to use individual shading structures over selected frames that are more difficult to relocate (the heavier large-sized frames with healthy coral growth). Two of our lagoon temperature loggers have been deployed in the middle of the channel (at 10m and 25m) close to Landaa, exposed to fast-moving water. The remaining two loggers were placed at shallower depths (3m and 5m) to record the sheltered reef flat surrounding the island. Ocean temperatures in the lagoon at Landaa Giraavaru, Maldives (2013 – 2016). Note the abnormally large spike in April 2016, that resulted in the major coral bleaching event across the Maldives (and worldwide).